Bob`s Red Mill Whole Grain Oat Flour is a great way to make whole grains part of your healthy diet. Made from pure oats, their Oat Flour has a subtle, sweet whole grain flavour. Oats are higher in protein and healthy fats, and lower in carbohydrates than most other whole grains. Add to your baking recipe or as a thickener or breading. Oat flour can replace up to 20% of the flour in your recipe. Using Oat Flour in your favourite pancake, pie crust, muffin, biscuit or bread recipe adds true whole grain oat flavor and wholesome nutrition. 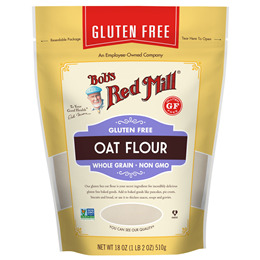 Below are reviews of Bob`s Red Mill Oat Flour - 400g - Best before date is 7th June 2019 by bodykind customers. If you have tried this product we'd love to hear what you think so please leave a review. 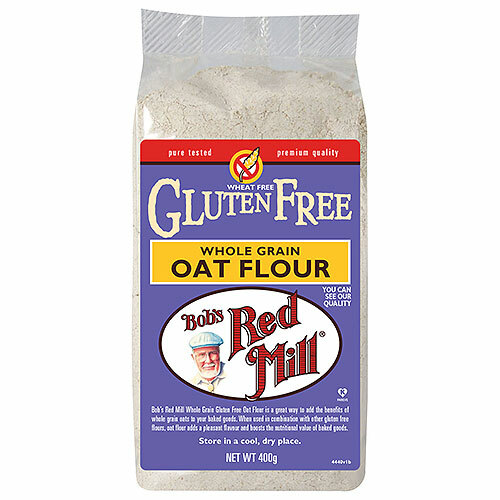 Bob`s Red Mill Whole Grain Oat Flour is a great way to make whole grains part of your healthy diet. Made from pure oats, their Oat Flour has a subtle, sweet whole grain flavour.